The USMC 2111 Small Arms Repairer/Technician MOS Coin was created for our motivated armorers. Without you, we wouldn't be fit for the fight. Semper Fi! RICHMOND, Va. - Sept. 22, 2017 - PRLog -- The USMC 2111 Small Arms Repairer/Technician MOS Coin was created for our motivated armorers out there. It is you ladies and gentlemen, that keeps our weapons of war in good shape. You undoubtably saved many Marine lives throughout the years. The last place you would ever want your weapon to malfunction is a fire-fight. To all of our 2111's, Devil Dog Shirts thanks you for your service. Semper Fi! Devil Dog Shirts has the Courage to be Honorable and Committed to our fellow Marines. We strive to perpetuate the Warrior Ethos in our Corps by creating the best gear a gun-slinger can buy! All of our apperal is made right here in the United States of America! We stand by our country and our fellow Marines as our nation moves forward! All of Devil Dog Shirts apparel is made and printed in the United States of America. Even in a competitive marketplace Devil Dog Shirts stands by this decision out of principle. Getting materials and printing locally in CONUS helps us to ensure customer quality for our fellow Marines and family. Our team of Marine Corps vets play a central part in the quality products created at devildogshirts.com . Devil Dog Shirts designs are licensed by the United States Marine Corps Trademark and Licensing Office. Our designs depict the Courage, Honor, and Commitment of Marines worldwide! Semper Fidelis! USMC First In Last Out MEU Expeditionary Marine Corps Challenge Coin Released! 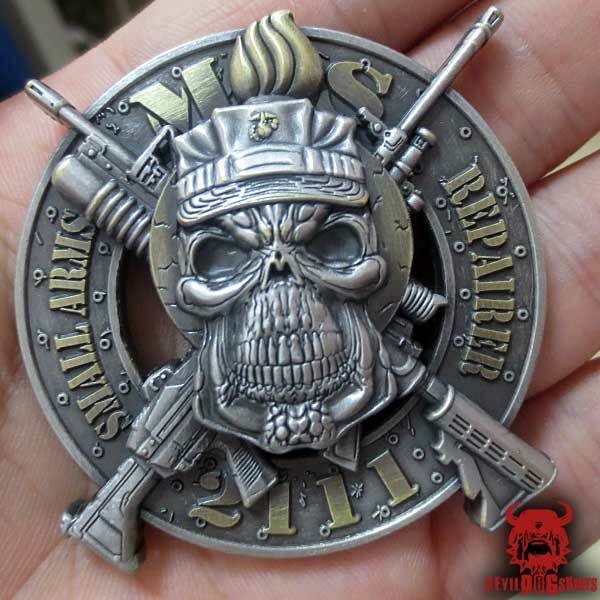 Spartan Warrior Ethos Marine Corps Challenge Coin just released at Devil Dog Shirts!